There are a range of auditoriums in Thiruvananthapuram to suit all budgets for a variety of functions. Premier venues in the city include the Subramaniam Hall at the Trivandrum Club, Royal Hall and Community Hall at the Sree Moolam Club Events that can be held here include corporate events, weddings and receptions, cultural events, parties, seminars and conferences. These halls offer all facilities including air-conditioning, dining facilities, a modern kitchen, parking facilities and access for the disabled. Senate Hall in Palayam is another popular venue for cultural events. It is next to the Kerala University Campus and easily accessible from all parts of the city. The YMCA Hall at Statue Junction is one of oldest such halls in the city and continues to host many functions. The Al Saj Convention Centre is the latest of its kind offering all modern comforts and facilities to host anything from weddings to exhibitions. Spread over 12 acres in Kazhakkoottam, next to Technopark, it can accommodate more than1,000 people at a time. Ragam Auditorium, also in Kazhakkkottam, can host large gathering too with a capacity of 1,700 with all modern facilities including ample parking space. 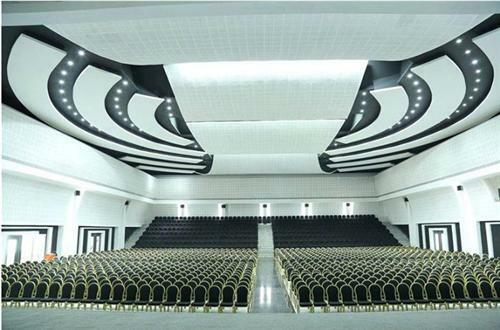 New Sreeragan Auditorium in Pappanamcode is another such modern facility in Thiruvananthapuram.